We’re starting off the Easter weekend in clean eating style with Coconut Carrot Cake Protein Donuts. 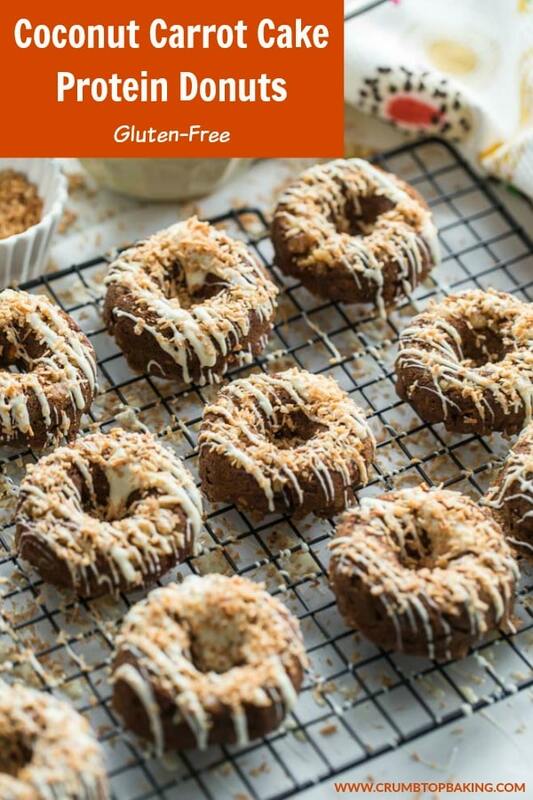 Gluten-free, loaded with protein and fibre, and possibly the most delicious healthy donuts you will ever make! Where are all my carrot cake lovers? If you’ve been following for a while, you know I love all things carrot cake. So it should be no surprise that I would share a carrot cake recipe just before Easter, which is really the unofficial start of the carrot cake season, right?! So you just really need to be into little golden, cakey donuts, packed with cinnamon, white chocolate and toasted coconut! 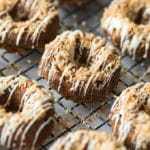 These Coconut Carrot Cake Protein Donuts are actually a spin on an earlier recipe I posted on the blog for Coconut Carrot Bundt Cake. The addition of coconut to carrot cake was a big hit, so I decided the flavour combo had to be replicated in donut form. And for that form, I borrowed from my recipe for Pumpkin Pecan Protein Donuts, which uses a combination of oat flour and vanilla protein powder as the donut base. If you haven’t tried protein donuts, they’re one of my favourite clean eating snacks. In this recipe, you get your protein from the powder, eggs and walnuts, as well as a punch of fibre from the oat flour. And the best part? They’re not only gluten-free, but if you forgo the white chocolate drizzle, they’re refined sugar-free too! As usual, if you make this recipe, I would love to hear about it in the comments below! Have a great long Easter weekend! 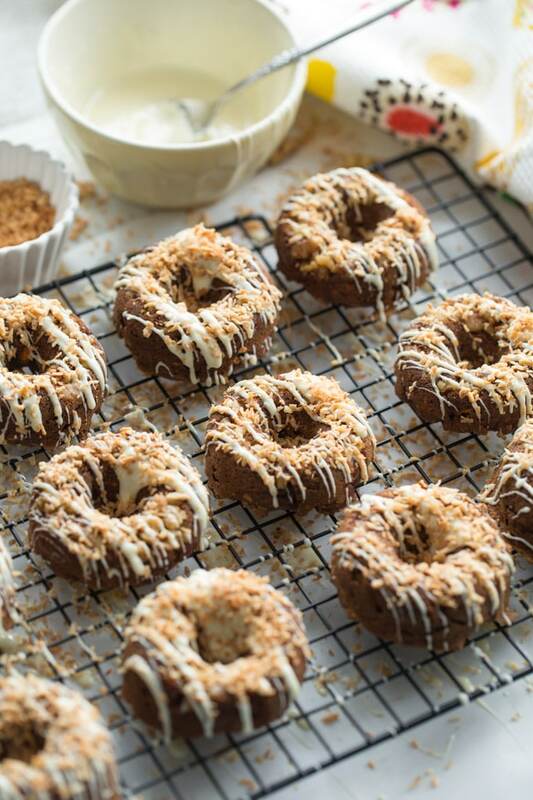 Coconut Carrot Cake Protein Donuts are a clean eating, gluten-free treat with a touch of decadence! They’re made with oat flour and protein powder, packed with coconut and cinnamon, and topped with a white chocolate drizzle. Pre-heat oven to 350 degrees and grease a 12-cavity donut pan. Sprinkle the walnuts into each cavity. In a large bowl, stir together the oat flour, protein powder, cinnamon, baking soda and salt. In a medium-sized bowl, whisk together the almond milk, oil, egg whites, apple sauce and honey. Make a well in the middle of the dry ingredients and pour the wet ingredients into the well. Stir until well combined but don’t over mix. The batter will be thick. Stir in the grated carrot and 1/2 cup of coconut. 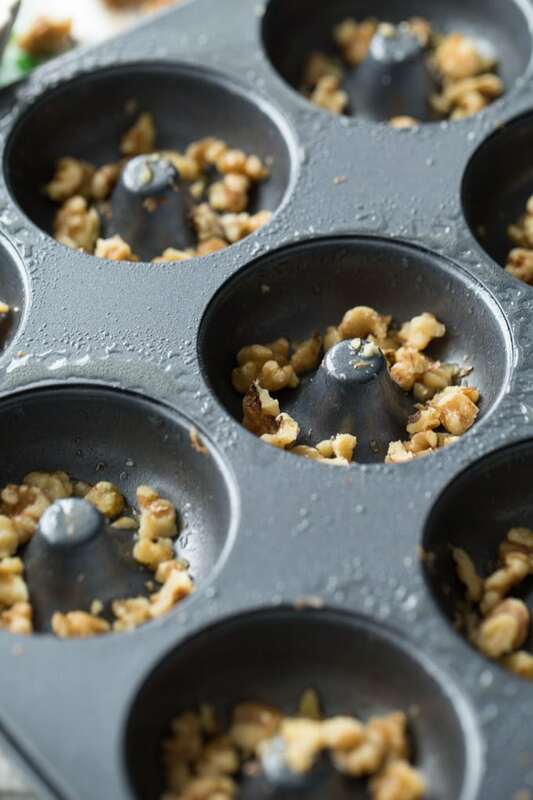 Spoon the batter into the donut cavities, spreading evenly but being careful not to disturb the walnuts on the bottom. Bake for 15-17 minutes, or until a tooth pick inserted in a donut comes out clean. Remove from oven and let cool in pan for 10 minutes. Turn out donuts onto a wire rack and let cool completely. For the optional topping, melt the white chocolate chips and coconut oil in the microwave for two 30 second intervals, stirring in between intervals. Drizzle the white chocolate over the donuts, and top with toasted coconut. Place in the fridge to set up. Donuts can be stored in an airtight container in the fridge or on the counter and enjoyed within 2-3 days. For gluten-free donuts, ensure your oat flour and protein powder are gluten-free. The white chocolate drizzle is completely optional. 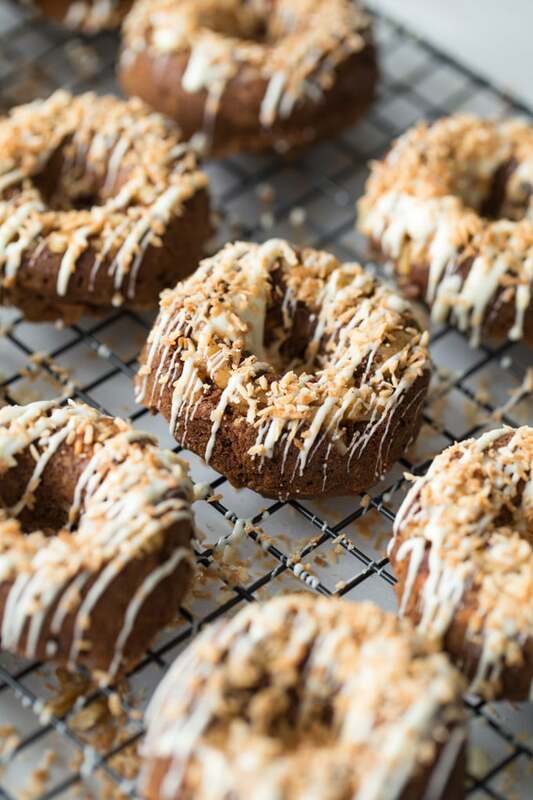 These coconut carrot cake protein donuts are calling my name Leanne. I looks really yummy. Have a lovely weekend. 🙂 Pinned! Thank you Puja! I’m hope you’re having a lovely weekend too! Love carrot cake and love donuts! I wouldn’t feel one bit guilty eating a couple of these 🙂 If your hubby doesn’t like veggies in dessert, that’s actually a good thing…more for you…or you could send some along my way 😉 Hope you have a wonderful Easter weekend, Leanne! Haha! Thanks Dawn! I’ve already had requests for deliveries in town, so I could totally hook you up! Hope you’re having a lovely Easter! Finally! A donut I won’t feel guilty eating! Thanks Leanne! Carrot cake donuts with coconut and walnuts? I’m in! Love their are a healthy version (which means you can eat more haha). Well done! Haha! I like your logic Ben! Thanks and happy weekend! Love that you amped up the protein in these Leanne! Baked donuts are my favorite, and so is carrot cake! Thanks Mary Ann! 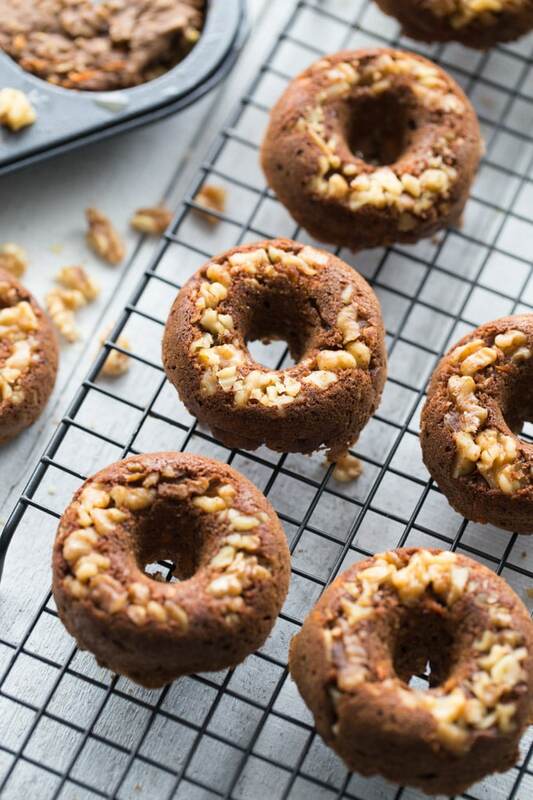 Carrot cake is definitely my fave, and the protein powder works really well in these donuts! Ohhhh donuts, I used to make so many everyday at 3am and didn’t like them then and don’t like them now. But this kind I think I could stand. I love the walnuts in there. Have a great weekend! I love your honesty Patrick! I always like to add walnuts or pecans to my donuts. Adds a nice crunch! Hope you’re having a great long weekend! I usually add coconut to my carrot cake and I love the combo. So I am loving these donuts, from the crunchy walnuts to the oat flour, passing by that lovely white chocolate drizzle. Thanks Nicoletta! I always add coconut to carrot cake too. I love the taste and texture! Hope you’re having a lovely weekend! I am 100% pinning these donuts. I’m cutting back on refined sugar but still crave sweets. Naturally sweetened foods are my go-to now so I have a plethora of honey in my house. My only problem with your food photography is I’m unable to reach through my computer screen, into your delicious looking photo, and grab a donut! Haha! Thanks Christina. That is a bit of a flaw with food photography and computer screens, isn’t it?! I hope you get to try these! I’ve also cut back on refined sugar, so honey and maple syrup are always in stock in my house! Carrot cake donuts sound like an awesome treat! I am loving the drizzle on these and especially the coconut! 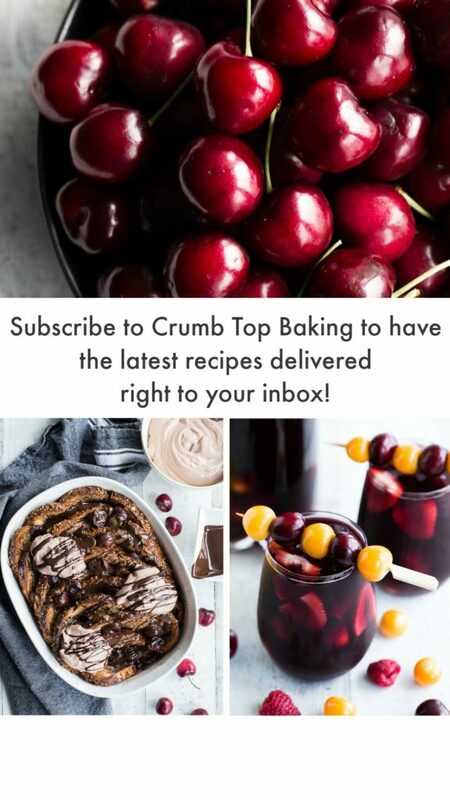 What a fantastic looking recipe – donuts are one of my faves! Thanks Vanessa! The white chocolate and toasted coconut topping makes these donuts a bit more of a treat for sure! I tried these tonight….they are beyond yummy!!! These will be be something I make on a regular basis! Thanks Gail! I’m so glad you liked them! Let me know how it goes when you make them! Happy Easter! I love carrot cake and those donuts look absolutly delicious! What a good idea to add protein powder in the treat! I’ll toy for sure! Have a great week-end! Thanks Nathalie! I like the taste and texture that the protein powder adds. It’s not a lot but the vanilla flavour adds a slight sweetness to the donuts! Happy weekend to you too! I just made some healthy carrot cake breakfast cookies and now I want to make these! I love how wholesome these look and I have everything I need to make them. These would be a fun breakfast for spring break! Thanks Marcie! I hope you get a chance to try these donuts. Carrot cake breakfast cookies sound delicious. Totally something I would love to try! Happy weekend! Thanks Albert! That’s so nice of you to say! They were definitely enjoyed by our family and friends over the holiday weekend! I’ve never came across a donut that I didn’t like! These look amazing! I love how healthy these are while still being a decadent treat. They look delicious!! Thanks Natalie! The best of both worlds!! You already know that I love all things carrot cake 😉 These are so great, Leanne. Can’t wait to try them for the boys! What kind of protein powder do you use? Let me know! Also – love the nuts baked into the top!!! Haha, yes, I’m totally aware of your love for carrot cake!! What’s not to love?! I hope your boys like these donuts. For this recipe, I used a vanilla plant-based protein called Leanfit. Thank you for the great job you do! Thanks Codrut! I hope you and your girlfriend get a chance to make these donuts! Be sure to let me know how they turn out! Hi Melina! I’ve never tried making these donuts with less oil. I usually try to include some healthy fats in my baked goods, so I’m not sure how the texture of these donuts would work if they had less than 1/4 cup of evoo. As for the nutritional information, I don’t have that available right now, but I’m actually working on including it for all my recipes, so it will be available soon! Thanks for stopping by! I need to buy a doughnut pan soon! This carrit cake is in my list now and I love how you added to nuts right at the end, gives a pretty visual too to the cake. Thank you! I bought my donut pan about a year ago, and it’s been great for making healthy donuts! 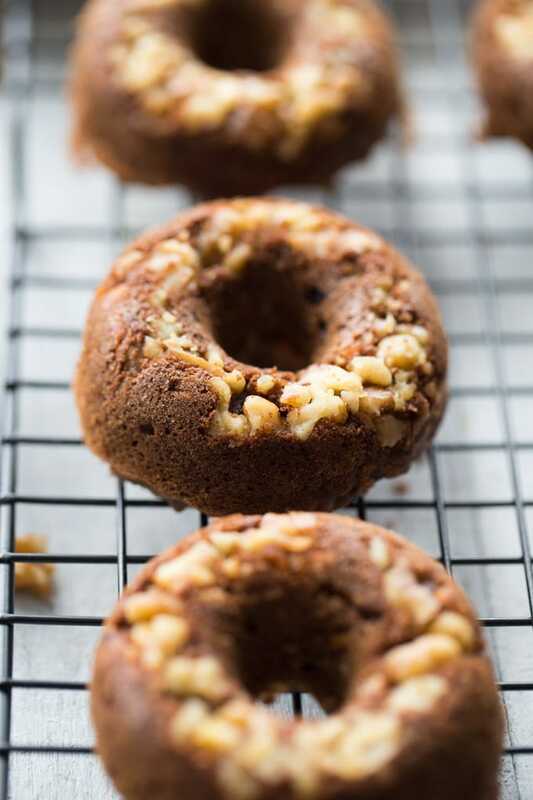 And I love baking walnuts or pecans into the tops of the donuts! Hope you get a chance to make these soon! Carrot cake in donut form? Count me in! And the fact that these are gluten free makes me really happy. I can’t wait to make these!